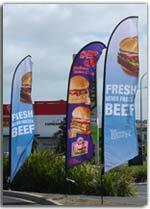 "Wendy's Old Fashioned Hamburgers" restaurant group had the team at Colourworx print a number of iFlags earlier this year. Each restaurant through out New Zealand has three of these flags displayed outside the restaurant. The designs are very eye catching and we have been impressed by the impact of this form of advertising and by the quality of the product and the service received.